ALEX PARDEE'S LAND OF CONFUSION: ZEROFRIENDS SF IS CLOSING & MOVING TO LA! ZEROFRIENDS SF IS CLOSING & MOVING TO LA! THOUGH IT WAS ALWAYS SUPPOSED TO HAPPEN LIKE THIS, THAT DOESN'T MAKE IT ANY EASIER. 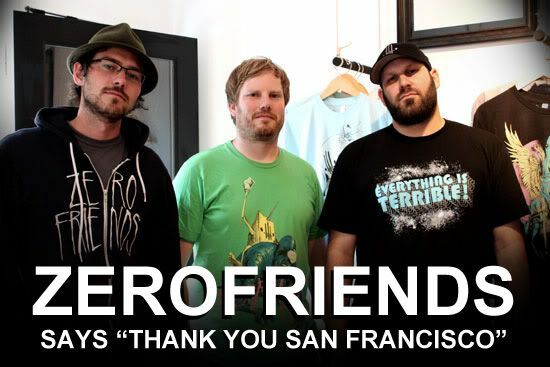 ZEROFRIENDS SAN FRANCISCO IS CLOSING THIS WEEKEND! 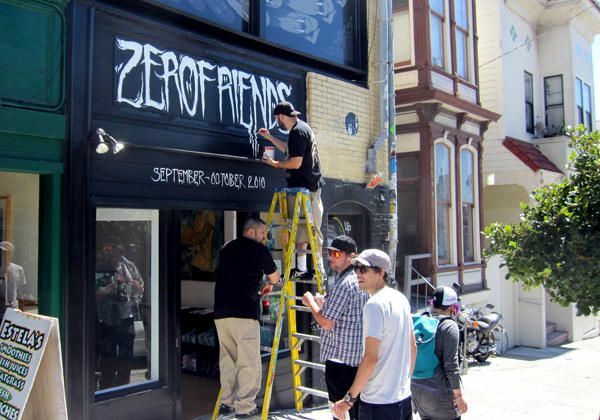 It seems like only yesterday I was getting high fives from my new Upper Playground neighbors, up on a ladder with Robert Bowen, painting the sign above the threshold of the Zerofriends San Francisco pop-up store. In reality, yesterday I was dressed as a clueless lazy-eyed delusional filmmaker and wiping pizza grease off in my fake hair while laughing alongside half of San Francisco's lower Haight district. That one freaky white-haired X-men chick whose eyes fill up with sperm and who makes it rain like a sonofabitch must have secretly been hiding behind me over the last two months because my life has been a WHIRLWIND over these past 60 days. Juggling commercial jobs, personal art, and the Zerofriends store events has been a blast, or a blur, or a blurry blast. But regardless, it's been amazing. Zerofriends has always been a local brand, and to physically have an actual retail store location to make us FEEL local, in our hometown, was a dream of mine. We could not have even had this fun opportunity were it not for UPPER PLAYGROUND, who has supported Zerofriends astronomically, giving us a HUGE opportunity in New York to introduce our brand to the retail world last year, and continued their support throughout this run in San Francisco. And thank you to the entire Lower Haight neighborhood, its tenants, as well as its crazy people who left the hospital or jail and wandered straight into our store to try to fight us for being weirdos, and Mister Rogers, who all made us feel welcome in their neighborhood. And some amazing artists came by over the course of those few weeks to hang as well, and some even lended their talents to some store events. Nate Van Dyke, Dave Correia, Robert Bowen, Skinner, Hannah Stouffer, Justin Lovato, Mike Kershnar, Tara McPherson, Aesop Rock, Kevin Hayes, Jon Wayshak, Jeremy Fish, Jon Schnepp, Mars-1, Buffmonster, Matt Richie, Alex Tarrant, Cage, Clay Enos, and so many more. So surreal. We are gonna miss not having the store open in SF, but hopefully the love and support will continue IN NORTH HOLLY WOOD WHEN WE OPEN OUR NEXT POP-UP SHOP THERE IN MID-NOVEMBER!!! Yep, we are bringing the carnival of friends to LA courtesy of our good friends at CELLA GALLERY and the North Hollywood Arts District! But more on those specifics & location later. For now, Sean, Darren, and myself simply want to say thank you and goodbye, San Francisco. We will see you again soon, and we love you. MOVIE KNIGHTS #8 Photo Recap: THE ROOM! MOVIE KNIGHTS #7 Photo Recap: THE THING! MY FIRST ART-BASED IPHONE APP NOW AVAILABLE! SCHNEPP HAPPENS! Secret Movie Knights RECAP! SPECIAL FREE MOVIE KNIGHTS EVENT TOMORROW! MOVIE KNIGHTS #4 Recap: "NIGHT OF THE...."
4 NEW MYTHICAL SHIRTS FROM UPPER PLAYGROUND! Movie Knights #3 recap: BEASTMASTER! My (Kinda Long) HATCHET 2 Review!